Mounts in place of the outer axle spacer. Color: Black. Instructions not included. Material: Billet Aluminum. High quality ! USA STOCK! Fats Shipping! Color: Black. Laws concerning this product vary from state/province to state/province. ⚠️WARNING: This product may contain chemicals known to the State of California to cause cancer, birth defects or other reproductive harm. Material: CNC Aluminum. A perfect choice for refit your motorcycle. With light design to keep you safe at dark night. Otherwise deal is final. All products are quality checked. Product Description: Universal CNC Aluminum Motorcycle Rear License Plate Mount Holder with White LED Light for Honda,Kawasaki,Yamaha,KTM,Suzuki,BMW. This bracket can fit most of motorcycle but not all motorcycle. 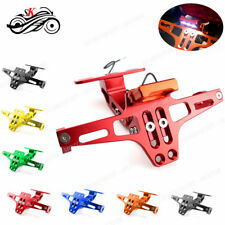 Specification: Condition: 100% Brand New Material: Aluminum Colors: black,blue,red,orange,titanium,gold,green (Please remark the color you want,or we would send you RED.) 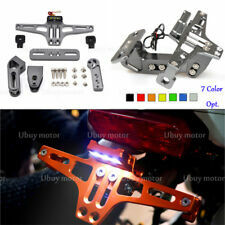 Package include:1 set of license plate kit. The color might have slightly different from pictures,there is chromatic aberration existed. Please make sure the part fits for your motorcycle before buying. If you have any question,please contact us immediately,we would be glad to help you. 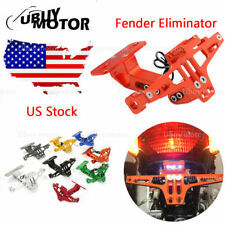 Product Description: Universal CNC Aluminum Motorcycle Rear License Plate Mount Holder with White LED Light for Honda,Kawasaki,Yamaha,KTM,Suzuki,BMW. This bracket can fit most of motorcycle but not all motorcycle. Specification: Condition: 100% Brand New Material: Aluminum Colors: black,blue,red,orange,titanium,gold,green (Please remark the color you want,or we would send you TITANIUM.) Package include:1 set of license plate kit. The color might have slightly different from pictures,there is chromatic aberration existed. Please make sure the part fits for your motorcycle before buying. If you have any question,please contact us immediately,we would be glad to help you. 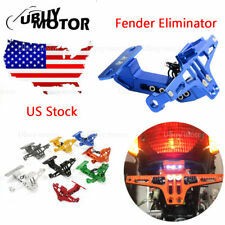 Product Description: Universal CNC Aluminum Motorcycle Rear License Plate Mount Holder with White LED Light for Honda,Kawasaki,Yamaha,KTM,Suzuki,BMW. This bracket can fit most of motorcycle but not all motorcycle. Specification: Condition: 100% Brand New Material: Aluminum Colors: black,blue,red,orange,titanium,gold,green (Please remark the color you want,or we would send you BLACK.) Package include:1 set of license plate kit. The color might have slightly different from pictures,there is chromatic aberration existed. Please make sure the part fits for your motorcycle before buying. If you have any question,please contact us immediately,we would be glad to help you. 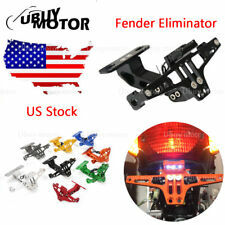 Product Description: Universal CNC Aluminum Motorcycle Rear License Plate Mount Holder with White LED Light for Honda,Kawasaki,Yamaha,KTM,Suzuki,BMW. This bracket can fit most of motorcycle but not all motorcycle. Specification: Condition: 100% Brand New Material: Aluminum Colors: black,blue,red,orange,titanium,gold,green (Please remark the color you want,or we would send you GREEN.) Package include:1 set of license plate kit. The color might have slightly different from pictures,there is chromatic aberration existed. Please make sure the part fits for your motorcycle before buying. If you have any question,please contact us immediately,we would be glad to help you.